ENGINE: The brilliant LC4 showcases twenty-four carats of fun. From the trademark 690 cm³ thumper, the engineers have now extracted a whopping 73 hp (54 kW) and 74 Nm of torque, making light work of the equally lightweight 690 Duke. How it happened? They completely reworked the cylinder head, inserted a new, ultra light and extremely strong piston and connection rod, rerouted the air intake through a resonator chamber and provided the crankshaft with sleeve bearings. As a result, the powerband is a thousand rpm wider, which means an even more uniform power delivery, especially in the mid to high rev range. Twin ignition featuring plug-selective mapping, rock solid but featherweight internals and optimized intake and exhaust systems cultivate this massive mono to be as strong as it is smooth, assisted by an advanced ride-by-wire system, which guarantees great refinement as well as low fuel consumption and emission figures. You’re green, while they’re green with envy. And you haven’t even begun mentioning upmarket goodies like a standard slipper clutch. FRAME AND SWINGARM: The 9 kg tubular trellis frame made from chrome-molybdenum steel and the equally lightweight, smoking hot swingarm, die-cast in aluminum, impress with extreme levels of torsional stiffness, providing the 148.5 kg Duke with excellent tracking stability and a continuous flow of information to the rider. Triple clamps lower the fork offset, which underlines this characteristic even further. You’ll notice. RESTRICTED POWER: A restricted power version is available for those riders who have just started their two-wheeled careers. 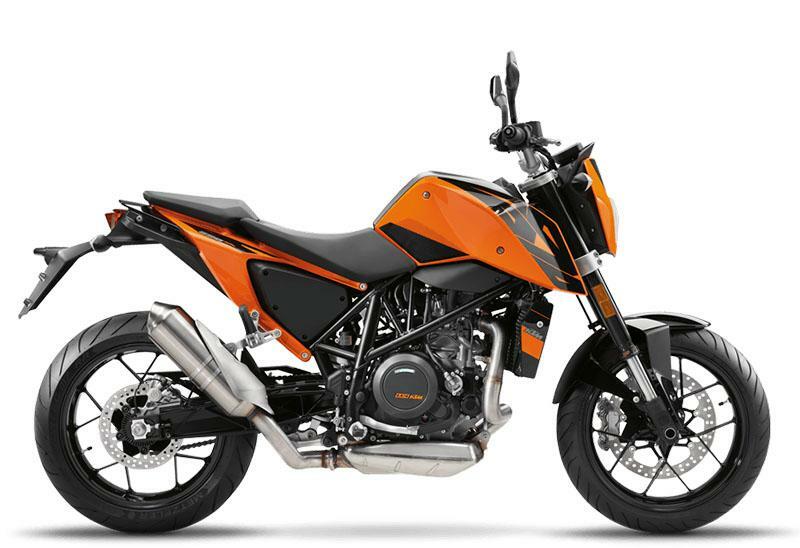 But restricted power doesn´t necessarily mean restricted fun: thanks to its lightweight and dynamic chassis, the KTM 690 Duke is the perfect playmate for all ages. Regardless of your experience level, the 690 Duke is your license to thrill.